The second you step onto the island of Ashdale, you'll be met by Gudrik. Be sure to complete his tutorial - it's quick, introduces you to the game's interface, and demonstrates the key concepts of RuneScape. Plus, you get to defeat an evil necromancer and nick her hat. Read on for a handy guide to your first few days in game, and beyond. First up, you'll need to know how to get around. Home Teleport: This returns you to any lodestone (circular stone plinths found in most major cities) that you've visited and activated. Note that this can't be done during combat, though. World Map: The best way to find your next adventure. Click the World Map button, then use the filtering options on the left of the World Map interface to find the type of content you're most interested in. RuneScape has a classless progression system and a vast, open world. It can be hard to decide what to do first. If you ever need a nudge in the right direction, the Path System is for you. It'll point you to content based on your choice of three categories: questing, combat and non-combat skills. 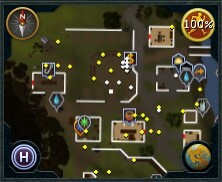 Click the Compass icon, then select the Path tab to get started. Daily Challenges are another great way to start levelling up and learning about the array of content RuneScape offers. These tasks can often be completed in as little as 20 minutes, and get you a nice chunk of XP to boot. Speak to Challenge Mistress Fara in Burthorpe to find out more. The joy of RuneScape is the freedom it offers. Be an intrepid quester, a mighty warrior, a deft artisan...or all of those things! Got the hang of the free game? Consider upgrading to membership to unlock everything RuneScape has to offer. RuneScape's quests are its pride and joy. No 'Kill 10 boars' here - each one is a hand-crafted slice of story, shot through with trademark humour and packed with tasty rewards. Your Quest Journal is the first stop - click the Compass icon, then the Quests tab. Stop a cultists' plot to unleash an undead horde on the city of Lumbridge. Speak to Xenia in Lumbridge Graveyard, then delve deep. Wreak gastronomic ruin on a greedy merchant and give power back to the people. Contact Nails Newton in Taverley and fight the good fight. Immerse yourself in a bloody murder mystery at a sand-blasted desert monastery, complete with full voice acting and musical tracks. Seek out Sister Catherina, east of Al Kharid. The gods have returned to Gielinor. Old grudges resurface as trickster Sliske kicks off a new war. Speak to Brother Samwell north-east of Varrock and start the Sixth Age's biggest storyline. Gielinor's a dangerous place, and many adventurers spend their days honing their combat skills to perfection. The perfect place to learn the ins and outs of RuneScape combat, and earn combat XP too. Speak to Lady Deathknell just outside Lumbridge to enrol. Heaving with trolls just itching for a scrap, this is a great place to start your combat training. Access the mine at the northern end of Burthorpe. Take tasks from a Slayer Master and travel the world, using special gear to slay Gielinor's deadliest beasts. Speak to Turael in Taverley to begin. Join the Void Knights and hold back the relentless incursion of the Void Pests, earning the right to bear the order's iconic armour and weapons. Head there from the Void Knight ship at Port Sarim. There's plenty of room for peaceful pursuits, too. Make your fortune crafting valuable items and selling them, level up support skills that'll help you as you travel, or even build your own home. Prayer grants useful buffs for many areas of the game, and holding back an eldritch monstrosity south of Lumbridge gets you a leg-up in the skill. Speak to Ysondria in Lumbridge Swamp and get your hands dirty. Gather, create and dominate. Collect valuable materials, then smith or craft powerful weapons and armour to use or sell. Speak to the skill trainers in Burthorpe for a head start. Bring a touch of larcenous class to Gielinor as you help found the dapperest den of villainy around. Enter the trapdoor north of Lumbridge and contact Darren Lightfinger to start the introductory Buyers and Cellars quest. Call forth beasts from the Spirit Realm to help you in combat, skill training and more. Speak to Pikkupstix in Taverley to start the Wolf Whistle quest.